Aviation and aeronautics have always been sources of inspiration for Richard Mille. As such, materials including titanium, carbon nanofiber, honeycombed orthorhombic titanium aluminide, ARCAP or even tungsten carbide have all found applications in the collection, stepping out of the aeronautical world and into the realms of watchmaking for the first time. The mechanical and aesthetic properties of these materials are now recognized in Haute Horlogerie in just the same way as precious metals. To explore these themes in greater depth, Richard Mille has created a caliber designed for flight navigation. This complete and technically sophisticated instrument is an ultra-modern interpretation of an essential device used by every established pilot. It also reproduces the materials and visual codes used in the aviation industry. The RM 039 AVIATION E6-B displays much of the same information provided by the famous E6-B flight computer, which was invented in the United States by Naval Lieutenant Philip Dalton during the 1930s. This round slide rule, incorporated into the bidirectional rotating bezel, can be used to read off and calculate fuel burn, flight times, ground speed, density altitude or wind correction, as well as the fast conversion of units of measurement (Naut/KM/Gallons/Liters/Feet/KG/LBS). The RM 039 tourbillon caliber is also equipped with a UTC hand, a countdown mode, an oversize date at 12 o’clock and a function selector. The tourbillon movement drives a flyback chronograph featuring an exclusive design. This complication provides pilots with a fast, practical device for measuring a series of successive elapsed times when navigating through different marker points. 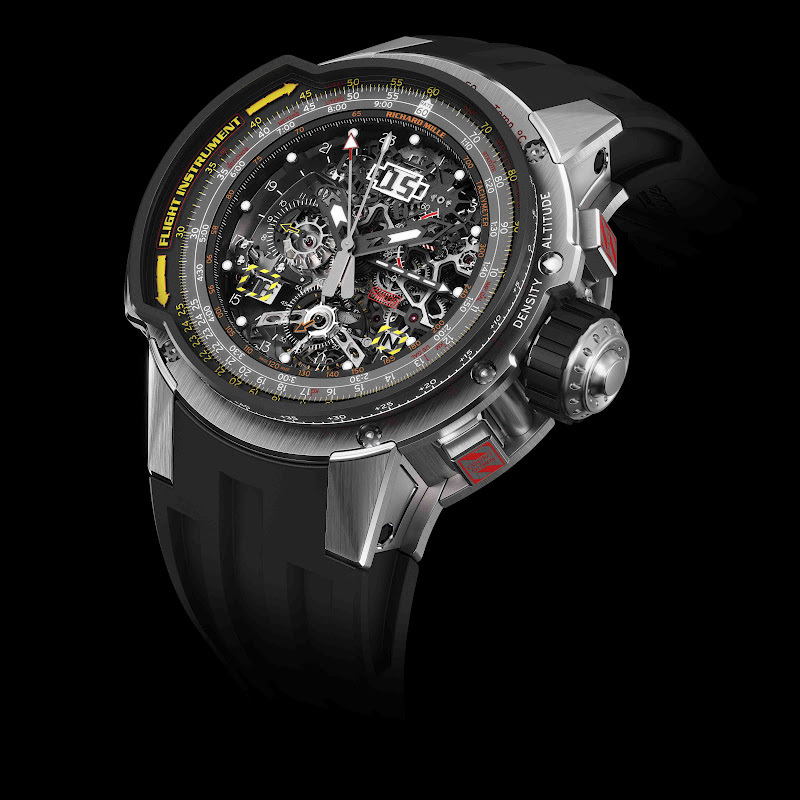 The flyback chronograph function combined with the E6-B flight computer brings the possibility of real time measurement to its functionality and applications. This new Richard Mille caliber respects all the codes and requirements of Haute Horlogerie, notably in the close attention devoted to every detail of the movement and case, both of which are remarkable for their exceptional finishing and complexity. The design of this tourbillon flyback chronograph required many years of research and development. This unique complication is the first of its kind at Richard Mille and the first of its kind in the world. This includes some 740 parts, 58 jewels and a power reserve of circa 70 hours displayed at 2 o'clock. It also incorporates the new patented crown mechanism presented on the RM 037, which protects the movement from shocks and poor manipulation.